Many respected vegan and vegetarian medical doctors recommend taking a vitamin B12 supplement when on a vegan or vegetarian diet. We have high grade vegan methylcobalamin pills available for sale. B12 has no known adverse side effects. This is a very useful vitamin for vegans, omnivores, vegetarians, bodybuilders, people with nerve problems, anemia and or absorption issues etc.. These are sub-lingual tablets of what is considered to be the most effective way to take vitamin b12. It’s much cleaner and more effectively absorbed than cycanocobalamin. It’s imported from USA because methylcobalamin is not made in Australia. Your questions about methylcobalamin b12 and health gladly answered by an experienced health enthusiast (email below). Sale now on! Order 2 bottles or more and get a 10% discount! 4 types available (All clean, proven and safe vegan ingredients). Australian dollar prices. 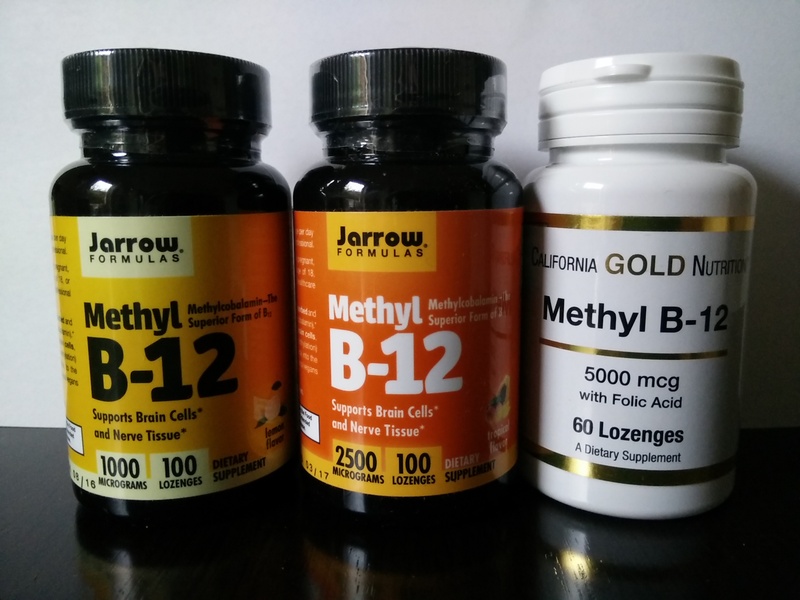 Or mail order ($8 postage within Australia (up to seven bottles in same packet for the same price), will ship internationally). .
email healthrawk@yahoo.com or text 0423 348478 with your order and or questions about vitamin b12 and diet. Payment is via bank transfer or paypal. One of the pitfalls of pursuing a healthy diet is that we are sometimes blind to nutrients we may be missing. And in the world of healthy eating, one of the most common nutrient deficiencies involves vitamin B-12, a crucial nutrient for nerve health and the construction of red blood cells that carry oxygen throughout your body. Vitamin B-12 deficiency is especially common among vegetarians and vegans, but it’s also surprisingly common in meat eaters, too. Why? Because vitamin B-12 can only be absorbed in the small intestine, and due to common intestinal ailments, even many meat eaters who consume high levels of B-12 are unable to absorb it in their gut. This leads to a series of seemingly “mystery” health symptoms that actually have a simple common cause: Vitamin B-12 deficiency! B-12 deficiency is shockingly widespread. Studies now show that up to 40% of the population may be deficient in vitamin B-12 (http://news.bbc.co.uk/2/hi/health/7595423.stm). … in addition, vitamin B-12 deficiency can actually cause brain shrinkage, according to a University of Oxford study (http://news.bbc.co.uk/2/hi/health/7595423.stm). Although more work needs to be done, research is already suggesting a link between vitamin B-12 deficiency and Alzheimer’s. If you (or someone you know) shows any of the symptoms listed above, I urge you to immediately investigate vitamin B-12 and determine if a deficiency in this nutrient may be causing your symptoms! Again, vitamin B-12 deficiency is especially common in vegans and vegetarians because typical vitamin B-12 sources (meats, yogurt, etc.) are simply not present in their diets. But even meat eaters can be deficient in B-12 due to poor digestion. This is especially true for older people who suffer a diminished ability to absorb nutrients in their small intestine. In addition, diabetes medications and even pain pills can interfere with B-12 absorption, and intestinal parasites can also strongly block its absorption in the gut. Traditionally, people who are deficient in vitamin B-12 have received injections of B-12. This is extremely effective because it bypasses the digestive tract and goes right into the bloodstream. But it has one obvious downside: It requires being injected! So most people aren’t interested in this method. Instead, most people supplement their vitamin B-12 using nutritional supplements. But here’s where this can go wrong: The most commonly available form of vitamin B-12 on the market is the cheap synthetic form that’s actually bound to a cyanide molecule (yes, cyanide, the poison). It’s called cyanocobalamin, and you’ll find it in all the cheap vitamins made by pharmaceutical companies and sold at grocery stores and big box stores. Action item: If you have any vitamin B-12 supplements, check the ingredients label right now to see what form of vitamin B-12 they contain. If they contain cyanocobalamin, throw them out! Cyanocobalamin is a cheap, synthetic chemical made in a laboratory. It’s virtually impossible for you to find this form in nature. Low-end vitamin manufacturers use it because it can be bought in bulk and added to products with claims that they “contain vitamin B-12!” What they don’t tell you is that the vitamin is bound to a toxic, poisonous cyanide molecule that must then be removed from your body by your liver. Cyanocobalamin is also up to 100 times cheaper than the higher quality methylcobalamin which we’ll talk about below. Removing the cyanide molecule from the vitamin and then flushing it out of your body requires using up so-called “methyl groups” of molecules in your body that are needed to fight things like homocysteine (high levels cause heart disease). By taking low-quality cyanobalamin, you’re actually stealing methyl groups from your body and making it do more work at the biochemical level. This uses up substances such as glutathione that are often in short supply anyway, potentially worsening your overall health situation rather than helping it. This is one of the reasons why low-grade vitamins may actually be worse for your body than taking nothing at all! Cyanocobalamin, in summary, is a low-grade, low-quality and slightly toxic (cyanide) form of vitamin B-12 that’s used by all the cheap vitamin manufacturers. I recommend avoiding it completely. It won’t kill you to take it, of course, but there’s a better solution for B-12.